Osteochondritis dissecans, commonly known as OCD, is a disease of the cartilage that can affect various joints in a dog. In any joint in the body, two bones come together and movement is allowed between them. Where the two bones meet an exceptionally smooth area of cartilage covers their surfaces. This acts as a cushion and protects the underlying bone. If anything disrupts this smooth cartilage surface, movement of the joint becomes painful. In a dog with OCD, this cartilage is damaged or grows abnormally. Instead of being attached to the bone it covers, it separates or cracks. A loose flap of cartilage may form, or an entire piece may break loose. These are known as joint mice. OCD is primarily a problem in large or giant breed dogs. It has been reported in small dogs and cats, though it is not very common. It affects male dogs more frequently than females, most likely due to the males' larger size and increased stress on the joint. It generally occurs when the animal is between 4 and 10 months of age, though it can show up in older dogs. There are several breeds that despite being larger breeds have decreased incidences of the disease including the Doberman Pinscher, Collie, and Siberian Husky. OCD may affect the shoulder, elbow, knee or hock, although the shoulder is most commonly affected. The symptoms are lameness in the affected limb. Some dogs have a barely noticeable limp and others are unable to bear any weight on the leg. The lameness tends to worsen after periods of exercise and improves after rest. When it affects the shoulder, a shortened forelimb stride may be noted due to reluctance to flex and extend the shoulder joint. Occasionally, the disease will affect both limbs simultaneously and the dog may be reluctant to move. Diagnosis is based on history, physical exam, and radiographs (x-rays). On physical exam, we notice joint pain. For instance, most healthy dogs show no resistance when their shoulder joint is fully flexed and extended. However, if they have an OCD lesion in their shoulder, they may resist shoulder manipulation and may even cry out in pain when it is attempted. In addition, this flexion and extension of the shoulder joint may worsen the lameness. Radiographs of the affected joint are taken to confirm the diagnosis. The dog is often sedated so that full relaxation of the joint can be obtained. Several views of the affected joint and the healthy joint on the other side are taken for comparison. A change of the bone underneath the damaged cartilage is often visible. If the radiographs are not confirmatory but OCD is still suspected, radiographs may be taken again in 2 to 3 weeks. What causes the formation of OCD? Trauma to the joint, hereditary factors, rapid growth, hormonal imbalances and nutrition may contribute to the formation of OCD. The cause of OCD is considered to be multifactorial. It is thought that there are several factors that contribute to the formation of OCD lesions including trauma to the joint, genetics, rapid growth, hormone imbalances, and nutrition. Trauma, whether chronic or acute, may contribute to the formation of OCD lesions. Injury to the surface cartilage may lead to the separation of the cartilage from the bone or cause a decrease in blood supply that leads to cartilage flap formation. It appears that there is a genetic link between parents and offspring and the formation of the disease. Certain breeds and genetic lines are much more likely to develop the disease. Careful screening of parents against this disease is recommended during the selection of all breeding animals. OCD usually occurs during periods of rapid growth. Therefore, it has been suggested that nutrition that creates rapid growth may lead to the increase in incidence of the disease. There are currently two ways to treat OCD, conservative medical treatment or surgical removal of the lesion. Conservative treatment may be indicated for dogs that have early mild symptoms of OCD or where a specific lesion cannot be identified on radiographs. Conservative treatment consists of strict rest for 4 to 8 weeks. Leash walking is permitted but no running or playing is allowed. Anti-inflammatories and painkillers such as carprofen (Rimadyl) may be indicated. In addition, the use of glucosamine/chondroitin products has been suggested, yet there are no current studies that confirm their beneficial use in this particular disease. Conservative treatment may be difficult in young, active puppies who may still need to undergo surgery, if the symptoms do not improve. Surgery is indicated in animals that show severe symptoms, in cases where large lesions are identified on radiographs or when conservative treatments fail. The surgery is very straightforward. The affected joint is opened and the offending flap, defect, or joint mouse is removed. The prognosis is generally good when the shoulder joint is affected. 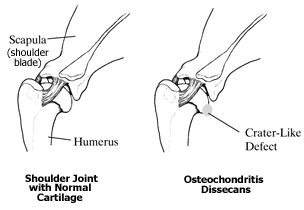 With other joints, degenerative joint disease (osteoarthritis) is more common. When the elbow is affected, the OCD may contribute to the development of other abnormalities in that joint. Prevention consists of careful selective breeding that avoids the breeding of animals with a history of OCD. Young large and giant breed dogs should not undergo strenuous activity, particularly jumping activities. Housing on hard concrete surfaces has been linked to increased OCD lesions in pigs and may also contribute to problems in the dog. Providing a good balanced diet that promotes even, sustained growth is also recommended. Talk to your veterinarian about what is best to feed your dog. OCD is a cartilage problem that affects young large and giant breed dogs. It is due to several factors including genetics, trauma, rapid growth, and nutrition. Treatment is either conservative including strict rest, or surgical removal of the damaged cartilage. Prevention is aimed at good genetic selection, reduced activity, and careful feeding.